The Minister State in the Federal Ministry of Industry, Trade and investment, Hajiya Aisha Abubakar has said the curriculum being designed by the Small and Medium Enterprises Development Agency of Nigeria SMEDAN for the certification and accreditation of Business Development Service Providers BDSPs in the country would address the identified challenges facing the MSME sub sector. She made this remark at the validation workshop on the proposed curriculum for the certification and accreditation of business development service providers BDSPs in Nigeria held in Abuja recently. She lauded SMEDAN and its collaborators for the efforts they have made in drafting the curriculum. She said this was in tandem with the desire of government towards ensuring global best practices in the development of MSMEs sector as well as sustainable growth in the country. Represented by Deputy Director, Industrial Development Department of the Ministry of Industry, Trade and Investment Mr. Opaluwa John, Hajiya Abubakar noted that 95 percent of enterprises in the world are micro small and medium enterprises and they account for about 60 percent of private sector employment, hence the need to recognize the sector in achieving the Economic Recovery and Growth Plan ERGP. The Minister however said the capacity of MSMEs in Nigeria to perform optimally has been hampered by numerous challenges such as access to finance, access to modern technology, inconsistency in government policy, unfair competition from imported goods and multiple taxes and levies among several others. She said the proposed curriculum was part of government’s effort toward realistically addressing the identified problems. The minister also said NEDEP was developed to address the challenges that are stifling the growth of the MSME sector in Nigeria. She said NEDEP provision includes the development of an accredited BDSP certification in Nigeria which serves as an input for determining the credit rating of MSMEs, adding MSMEs that have been trained by certified BDSPs would be deemed less risky. Hajiya Abubakar said supporting small businesses was essential to increasing productivity, creating jobs and boosting the economy, “This is why Government is working with stakeholders across all sectors to ensure that MSMEs have the support they needed to grow now and in the future”. 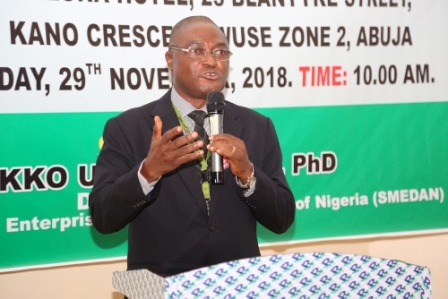 In his address, The Director General of the Small and Medium Enterprises Development Agency of Nigeria, SMEDAN, Dr. Dikko Umaru Radda said the need to have a minimum standard for business development service provides in the country cannot be overemphasized. He said Nigeria as a country is saturated with all manners of people who claim to be business development service providers and lamented that our MSMEs, are not deriving quality services from these BDSPs. Dr. Radda asked, “Can our MSMEs after passing through a Business Development Service Programme today be able to compete with their peers across the globe? 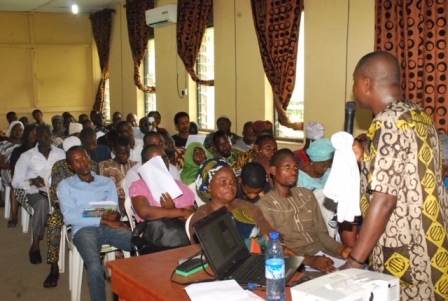 He said it was difficult, considering the kind of trainings they have received from unqualified MSME trainers. 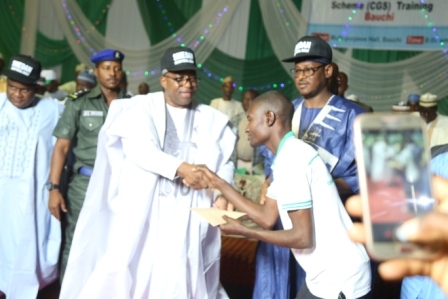 He said the SMEDAN decided to establish a frame work for making sure the content of Business Development Service Providers is of the minimum standard that can propel Nigeria MSMEs to compete effectively with their peers across the globe. Represented by Mr. Monday Ewans, the Director, Enterprise Development and Promotion Department of SMEDAN, he said we need to have a standard document, a standard procedure and a standard way of making sure that our BDSPs can be certified and recognized globally. He also commended the effort of MAFITA and other stakeholders who worked hard to make the framework ready. Dr. Radda said that the law that established SMEDAN gave it the legal right to accredit BDSPs in Nigeria, and called on all stakeholders to critically look at the document, “As whatever we do today is going to affect us as a government and as stakeholders. He urged them to look at the document and clear all bottlenecks as a critical mass of BDSPs who can now attend to these 37 million MSMEs in a very short time, so that we will join hands to achieve the MSMEs subsector of our dreams. Dr Radda disclosed that after fine-tuning the document, the Agency will kick start in the first quarter of next year, the training of initial trainers and that the Kaduna Business School and Enterprise Development Center of PAN African University in Lagos would be engaged for this purpose. He stated that the accreditation of BDSPs was dear to the Agency as its target was to have credible BDSPs in the country that can deliver quality services and achieve the desired goals.